With a renewal of vegetation and the lengthening of sunnier days, April and National Poetry Month are just around the corner. What better time to set pen to page in poesy? As Violet Gartenlicht said: “Spring in verses,/Verses in spring.” Follow these five tips to inspire your own poetic regeneration. • Pairing diametric opposites is often useful in amping up the thematic tension in a poem. Write a list of five or ten opposite pairings. Perhaps Republicans vs. Democrats, teacher vs. students, parent vs. teen, angel vs. demon, passive vs. aggressive, or even more abstract opposites, such as red vs. blue or square vs. circle. Draft a poem where two of the opposites have an argument with each other. By the end of the poem, there should be enough context clues to let the reader know who “wins” and why. • Write a poem in which you begin with one phrase or image and then circle back to that image or phrase by the end of the poem. It is important to note that the reader’s understanding of the opening phrase or image must be deeper after the insights of the middle of the poem. • Free-write a new poem in which two characters know each other intimately in one social setting and are thrown for a loop when experiencing each other in new surroundings. It might, for instance, be two divorced partners at a child’s school play or two best friends who learn something about each other while playing board games or seeing each other at the gym rather than at the local coffeehouse. • Study the final image of a poem draft. Does that image contribute to a deeper meaning in the poem? If not, it’s possible that your poem would be better served with another final symbol or image. Frequently, poets write past the most resonant symbol. Look in the middle of the poem and compare the meaning of an image found there with one placed at or near the ending. Try to invert the order of these images, to see which makes a stronger ending. If there aren’t any strong imagers to bring to the end of the poem, draft a new ending. I’ve heard it said that a good poem should be like a suspense movie haunting-- the experience resonates meaning, questions, and thought long after an initial appearance. • We’ve all experienced awkwardness, and probably plenty more than we’d ever care to repeat. Pen a poem in which the speaker appears calm and confident externally and yet inside, the speaker is struggling with either his or her own awkwardness or the awkward behavior of another person. What is being said (or, more likely, not said) between the characters? These and a myriad other tips and poetic exercises will be presented to get your pens moving as part of WOW! 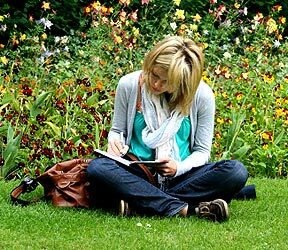 Women on Writing's online class Spring Forward!, starting on April 8 and currently accepting sign-ups. Melanie Faith holds an MFA in poetry from Queens University of Charlotte, NC. She recently had an essay about editing poetry published in the Jan/Feb 2011 issue of Writers' Journal. Her poetry is forthcoming from Tapestry (Delta State U., Spring 2011) and her essay about Thoreau and the internet is also forthcoming, from Front Range Review (U. of Montana, Spring 2011). A travel essay was featured in Quicksilver (U. of Texas, March 2010), and another published essay (Shape of a Box, Oct. 2009) was nominated for a Pushcart Prize. Her work won the 2009 Anne E. Sucher Poetry Prize for the Iguana Review. 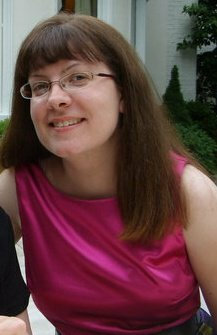 Her current poetry chapbook, Bright, Burning Fuse, was published by Etched Press (www.etchedpress.com) in Dec. 2008. She has been a small town journalist, an ESL classroom teacher for international students, and (currently) a literature and writing tutor at a private college prep high school. She has enjoyed teaching poetry and essay writing classes for WOW! for two years. Once again, Melanie's interactive workshop Spring Forward! starts on Wednesday, April 8th. The class is limited to 10 students, so make sure you reserve your spot today. Click here to sign up now! You're very welcome, Yvonne! I hope you find them useful as you write new poems!